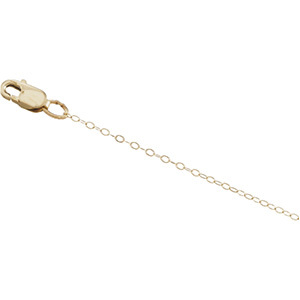 This 14k yellow gold 16in lasered titan curb chain has a lobster clasp. Chain width: 1mm. This chain is manufactured using a special, hard, gold alloy that is extremely firm and is specifically designed to enhance the laser welding process. This produces the strongest pendant chain available. It has a higher tensile strength and is up to four times more stretch resistant than ever before. This allows you to use lighter weight chains with heavier weight pendants. Higher tensile strength and laser welded joints guarantee that you will have less breakage. Weighs 0.55 grams. Please note: weight is approximate, actual weight may vary.